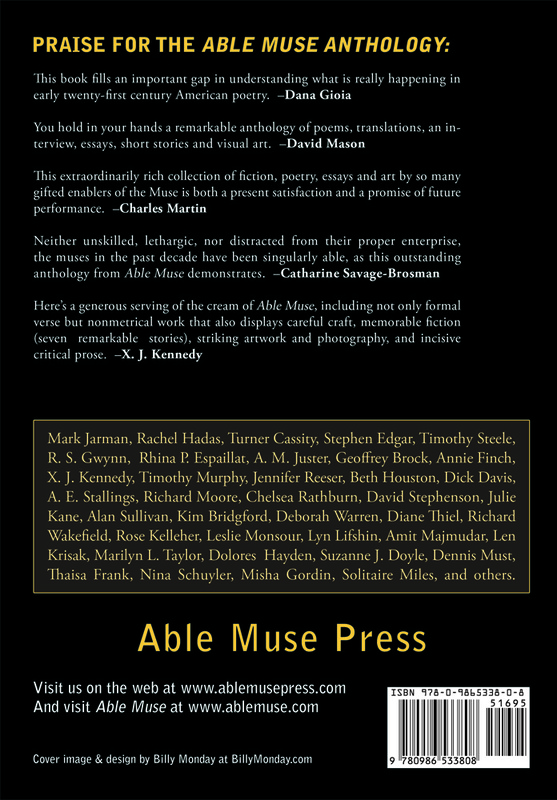 The Able Muse Anthology — from the new Able Muse Press — celebrates Able Muse’s journey through its first decade and beyond, by showcasing the best of the published poetry, fiction, essays, interviews, book reviews, art and photography, including a foreword by Timothy Steele. This anthology has received high praise and acclaim from Dana Gioia, David Mason, Charles Martin, Catharine Savage-Brosman, X.J. Kennedy, Catharine Savage Brosman and others.
. . . This book fills an important gap in understanding what is really happening in early twenty first century American poetry.
. . . You hold in your hands a remarkable anthology of poems, translations, an interview, essays, short stories and visual art.
. . . This extraordinarily rich collection of fiction, poetry, essays and art by so many gifted enablers of the Muse is both a present satisfaction and a promise of future performance.
. . . Neither unskilled, lethargic, nor distracted from their proper enterprise, the muses in the past decade have been singularly able, as this outstanding anthology of work from The Able Muse demonstrates.
. . . Here’s a generous serving of the cream of Able Muse,em> including not only formal verse but nonmetrical work that also displays careful craft, memorable fiction (seven remarkable stories), striking artwork and photography, and incisive critical prose.